Leave it to Disney to go all out like this. In a very rapid release of new apps, everyone's favorite kid-friendly distributor of films, TV shows, games and anything else that can empty parents' wallets has dropped on us three new titles. For starters, Nemo's Reef. 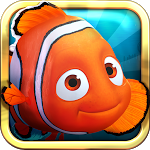 This let's-call-it-a-game expands on the Finding Nemo franchise (naturally), and allows players to create their own underwater reef. You can customize the fish's home, add various characters from the movies including Gill, Dory, Bloat and Bubbles, and even plant a variety of seeds.